He recently retired as Chief Judge of the Kansas Court of Appeals after almost 29 years as a Kansas judge, Judge Brazil was appointed as a District Judge in the Thirteenth Judicial District in 1972, where he served until his appointment to the Kansas Court of Appeals in 1985. He was appointed Chief Judge of the Court in 1995 and served as Chief until his retirement in January 2001. He has continued to serve the Supreme Court and Court of Appeals as a Senior Judge. 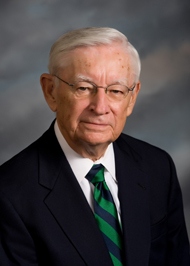 Since his graduation from Washburn University School of Law in 1962, he has been involved in a wide variety of legal matters and litigation, first as a lawyer in Pratt and Eureka, Kansas, then as a trial and appellate judge. He is past president of the Kansas District Judges Association; the 1994 recipient of the Kansas Bar Association Outstanding Service Award; a founding member of the Kansas Continuing Legal Education Commission; past chair and continuing member of the Kansas Judicial Qualifications Commission; and past-Secretary of the National Conference of Chief Justices of Intermediate Courts of Appeal. He is also a member and past president of the Sam A. Crow Inn of Court in Topeka and a Kansas Bar Fellow.